With Thanksgiving behind us, Christmas merry-making is now in full-swing! 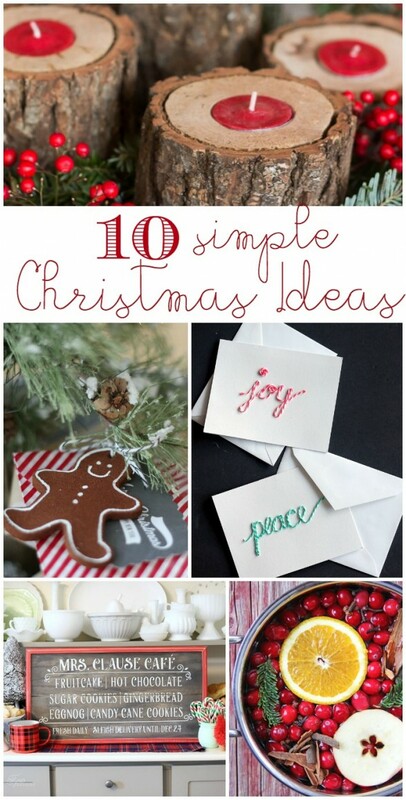 To help you transition into the season, here are 10 simple Christmas ideas to try. 1. 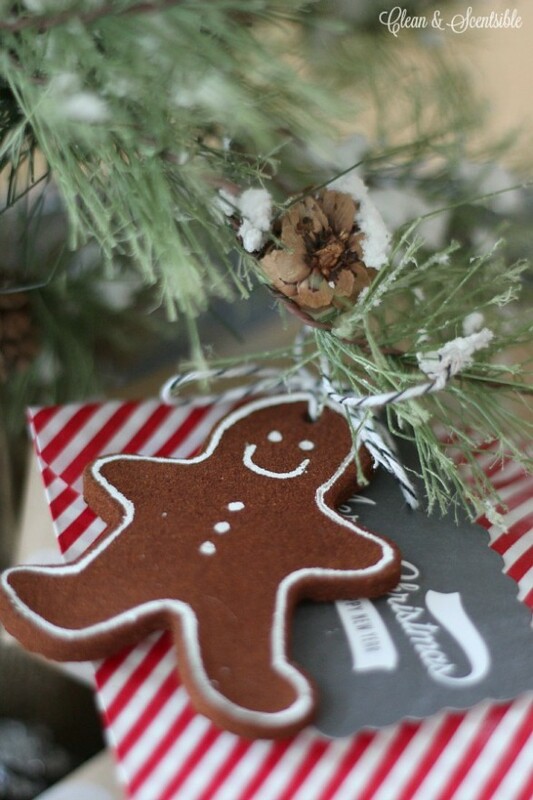 Make cinnamon Christmas ornaments with this recipe from Clean & Scentsible. This recipe is easy to make, smells great, and is fun to do with the kids. These ornaments look great on the tree or as a gift topper. 2. 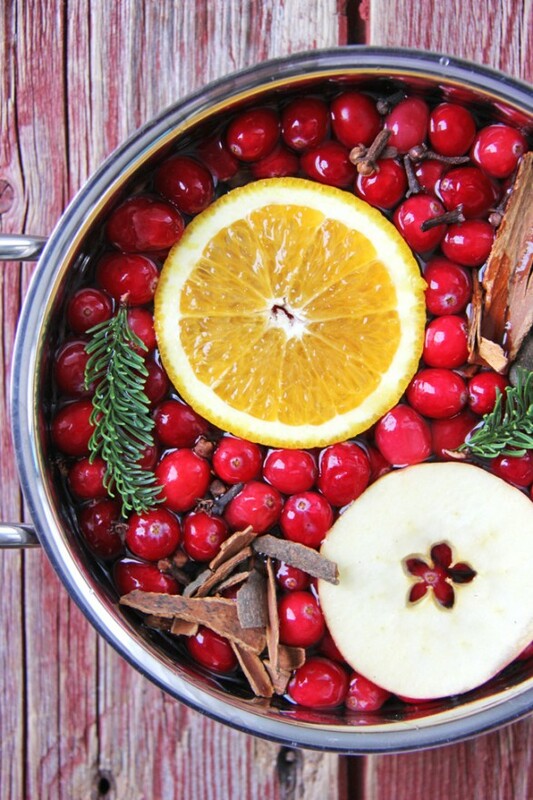 Cook up some Christmas Potpourri with this easy recipe from A Pretty Life in the Suburbs. This recipe is like having instant Christmas in a pot! Cranberries, cinnamon, orange, apple, spices, and pine all mix together to create a heavenly scent that is sure to bring Christmas cheer to even the grouchiest Grinch. 3. 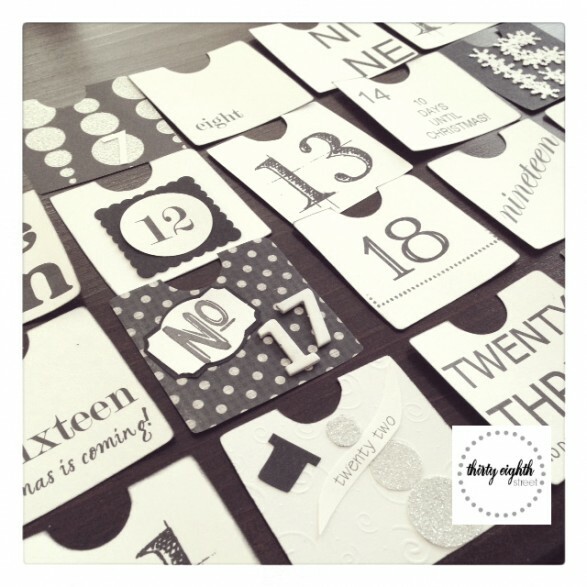 Create family memories with this free printable Christmas advent calendar from Thirty Eighth Street. Some advent calendars just give the kids a special treat for the day, but this one is guaranteed to give your family special memories with daily to-do’s such as have a picnic dinner around the Christmas tree and act out the nativity. There are still plenty of days left this month to begin your own advent! 4. 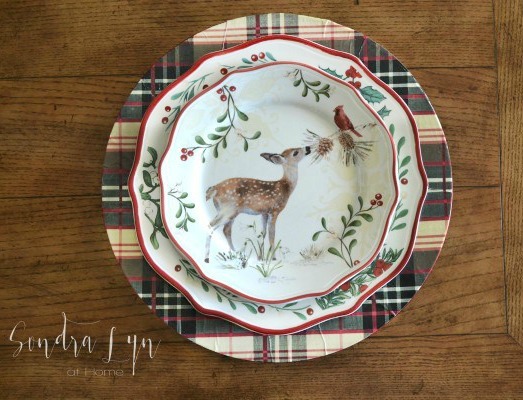 Decoupage custom chargers for your Christmas table with this tutorial from Sondra Lyn at Home. Wrapping paper, special glue, and clear plates are all you need to create gorgeous chargers at a fraction of the cost of retail. Sondra Lyn has the full tutorial for you. 5. 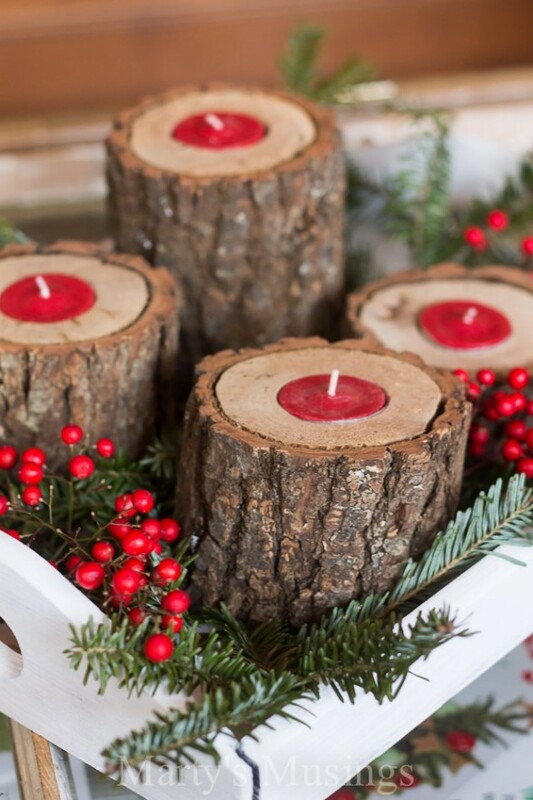 Make these rustic wood candle holders with the help of Marty’s Musings. If you have some logs, a drill, and some tea lights, then you have all of the materials needed for these cute candle holders. 6. 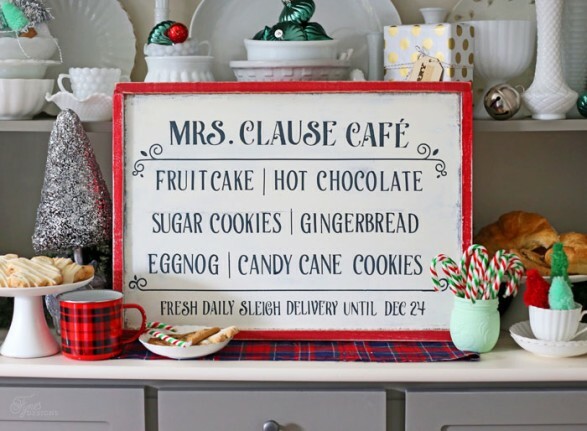 Create two Christmas signs using the same vinyl. Brilliant tip from Fynes Designs. Vinyl cutting machines are wonderful tools to have during the holidays and allow you to create all kinds of cute crafts. I love this tip on how to use the letters and the “negative” of your vinyl in order to get more bang for your buck. See Fynes Designs for the free download of this Silhouette file. 7. 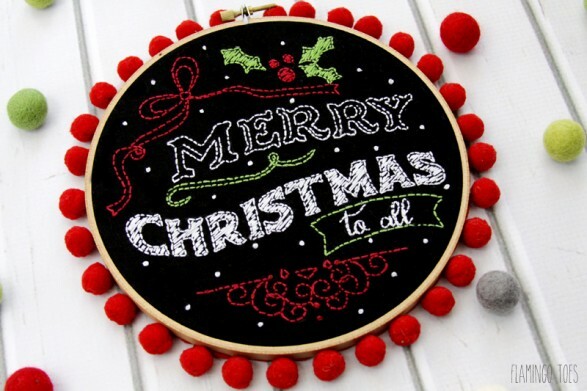 Try your hand at embroidery and create this chalkboard hoop art by Flamingo Toes. She promises that it is easier than it looks and that anyone can do it! Free printable pattern over on her site and all of the step-by-steps. This would make such a cute gift! 8. Make your own baker’s twine Christmas cards with this easy-peasy tutorial from The Country Chic Cottage. 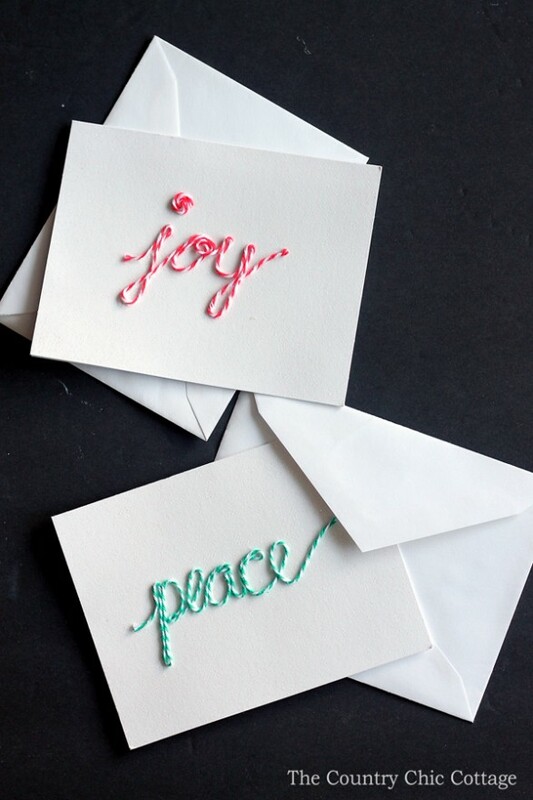 Blank cards, glue, baker’s twine and good penmanship are all that’s needed to create these sweet cards! 9. 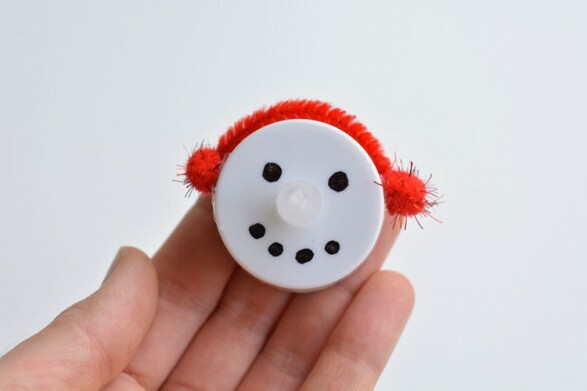 Create these adorable tea light snowman ornaments by One Little Project. Who knew that a dollar store tea light could look so cute? This would make a great kids’ craft. 10. 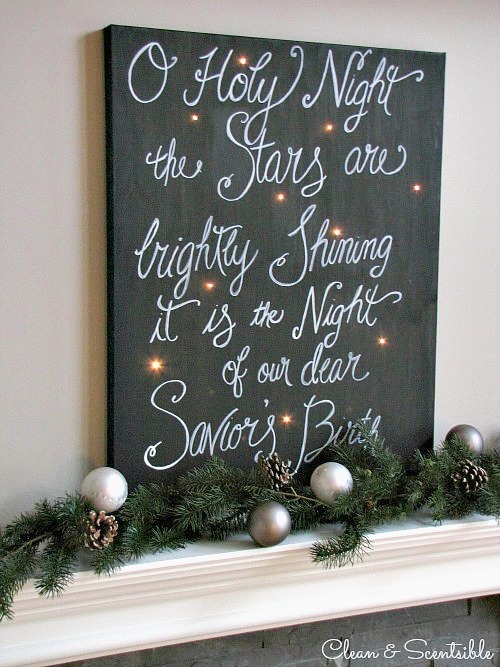 Create a twinkling Christmas canvas with this tutorial from Clean & Scentsible. 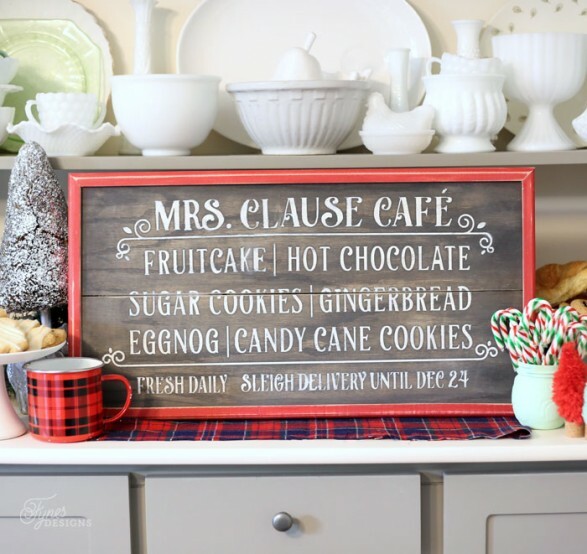 A “chalkboard art” canvas that twinkles! What’s not to love? And it’s easier to make than you might think. These candle holders are amazing! They look so natural and make the room so cozy. I can just imagine the pine smell. Happy Holidays! Hi Beth, I wanted to ask whether your home will be shown on any holiday home tour? I always look for yours first, because i love the way you decorate. Thank you Elie! I’m part of Just a Girl’s “Favorite Room Tour” next Tuesday. It won’t be a full-house tour but I will be showing more of my home then. My porch will be revealed next week as well. Thanks for following along! 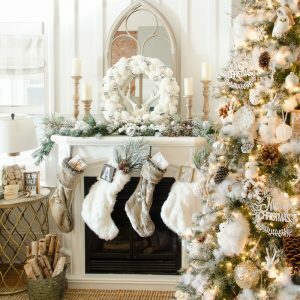 Your Christmas tree and mantel remind me of being a young girl in Germany and enjoying all the old traditions they celebrate, And yes plenty of snow and even little candles with foil catchers attached to the tree. thank you for taking me back in memory to such wonderfilled christmas magic! These are all fantastic Christmas ideas, Beth! Thanks so much for including my DIY plaid chargers! !